The Inspirational Speech, the last of the speech projects in the Competent Communicator manual, challenges you to pull together everything you’ve learned so far. Speech organization, presentation skills and the tricks of rhetoric to gain your audience’s attention and confidence all go together into a final speech project. This speech assignment suggests several techniques to emotionally connect with your audience. This is not the time to be subtle. Go big! Go dramatic! While you’re expected to inspire your audience, this is also a great speech to try something new. Did you see someone use a technique you’d like to try? My first Project 10 speech was my favorite. While gasoline prices topped $4.00 a gallon, I gave a speech about hypermiling. Using techniques to reduce your gas consumption while driving could hit my audience with information and motivation to change some of their ingrained driving habits. The single drawback to speaking that day was a severe case of tendonitis in my knees. I’d never seen anyone give a speech sitting down, but that day, it was my only hope. Before the meeting, I asked the sergeant at arms to put two chairs in front of the lectern. I acted as if I were getting into the car with my first sentence, and gave the rest of the speech sitting down. I expected to be called on it. But my evaluator thought it was clever to act as if I were driving for the speech. Truly, from the strangest inspiration come the best ideas. This speech is about inspiration – so you need to be inspired. I get a lot of questions about what to do with this speech. A general misunderstanding of what inspiration is causes a lot of stress for speakers. Don’t expect to inspire someone to do something they wouldn’t already consider doing. Inspirational speeches need the audience buy into the topic and idea long before the speaker comes to the stage. Introducing new ideas are rarely inspirational – those are informative speeches. If you want to bring new ideas to your audience, please do it! But you won’t likely reap much success with it. Any person needs multiple exposures to information before they’re open to change. With all this in mind, pick a topic that you’re passionate about. Me? I’m passionate about Star Trek. I’ve gone to conventions, I always get to the opening nights of the movies. Yes, I’m a Trekkie. It would be very easy for me to want to inspire others to join me in my trek to the final frontier of fandom. Make it easy on yourself. Pick a topic that you can speak about almost without preparation. I could speak about hypermiling because I’d been reading up on it and practicing it for months. When you’ve got a topic you love, writing the speech and finding the emotional points you want to share is easy. Now you can go big with your speech. Are you naturally a very subtle person, who likes things to be calm and serene? This speech could be that way… but I suggest you turn it up to 11 this time. Find ways to stretch yourself in this presentation. Now, my 11 is not your 11. Don’t judge yourself against someone else. Look inward and find at least one thing that you can do in this speech that pushes you past your comfort zone. That’s where you should go with this speech. Once your final speech is evaluated and the manual back in your hands, you need to hand the record sheet of your 10 speech projects to the club vice president of education. Using the Toastmasters International website, the VPE will input your information. A week or so later (always later if you send it in during June) you’ll get a certificate from Toastmasters and a letter telling you that you can order two free advanced manuals! Take advantage of this right away – the coupon code expires fairly quickly and will only be offered to you once. Congratulations! You now get to put CC after your name! It sounds like you’re done… but you’re not. Not at all. There’s a lot more to Toastmasters than just the Competent Communicator and Competent Leader manuals. 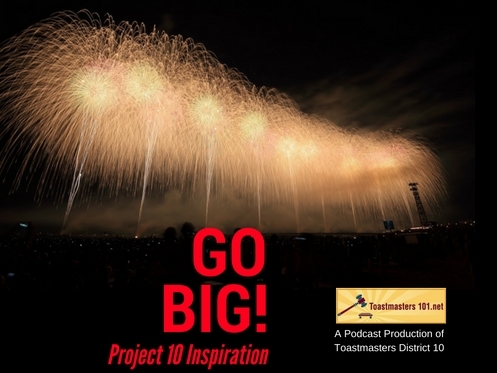 You can go big with Toastmasters. We’ll talk about those in our next episode: What’s Next?